In the last few weeks, I've realized that I have started doing a lot of cardio and have completely abandoned strength training. The gym that I go to has great classes, many of which are Les Mills. 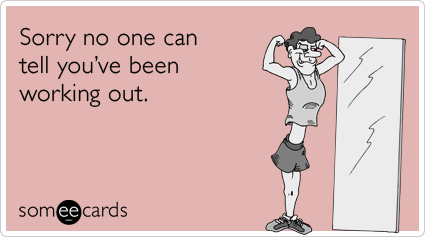 I actually joined the gym for Body Pump, which I fell in love with years ago. But strangely enough, I really don't go to Body Pump. 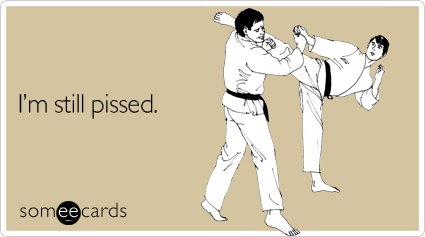 I go to Body Jam, Sh'Bam, and Zumba... and occasionally, if I'm feeling brave, I'll go to Body Flow. When you combine all that dancing with my running, I've got cardio covered, but no weights. So I was actually working really hard, but I didn't look like I'd been working at all. I toyed with the idea of going back to P90X. I tried Insanity and hated it, tried T25 and felt like I was going to die. P90X was the only thing that got me into amazing shape that I could stick with. But then I remembered that when I did P90X, I had no job, no social life, and my boyfriend lived in another state. I had all the time in the world to exercise, make protein shakes, and annoy my family by complaining about how sore I was. Now that I work a full time job (where I'm on my feet all day, usually in heels), kinda sorta have a social life, and have a boyfriend who lives two minutes away from me, I don't really have the time or energy to exercise for two hours a day. Which brings me to my new love: Kelly Coffey-Meyer. She answered all my prayers! Affordable workout DVDs that I can do right in my apartment? A great weight-lifting routine that does not require me to hire a personal trainer? And all of this in just 30 minutes?!! Seriously. These workouts are amazing. I am planning to do a full review of each one individually as I get more comfortable with them. I originally bought 30 Minutes to Fitness: Weights based on the reviews it had gotten. I did it twice and was so happy with it that I went back and bought several more of her DVDs. They are all fantastic. She has a very no-nonsense style that I appreciate - she's not barking commands at me like Jillian Michaels, she's not flexing her own muscles and bragging like Tony Horton. And while I truly love Chalene Johnson in all her Turbo glory, she is sometimes a little too much of a peppy cheerleader for me. Kelly Coffey-Meyer is just there to workout, which is all I need right now. And in 30 minutes, she makes me work very hard, but I don't feel dead at the end. Specific reviews to come, but now I have to change out of my sweaty clothes and work on that kinda sorta social life. Good evening, blogging world! I should rename this blog. When I went out for my run tonight, it was almost 8 pm and still about 90 degrees outside. It was hot, humid, and sticky. I was slow. I was slow not only because of the heat but because of the fact that I was still uncomfortably full from the lunch that I had several hours earlier. I met my friend Haylee for lunch at a place called Logan's Roadhouse. I'd never even heard of the place before Haylee mentioned it, so I looked up the menu. It looked pretty standard. Not true. Logan's Roadhouse is glorious. It is the place where dreams come true, and I work at the Magic Kingdom, so if I say it, it must be fact. Everything on the menu looked fantastic. But I am only one month away from Dumbo Double Dare, so I'm trying to get my workouts in and watch what I eat. So I was looking at a grilled chicken sandwich, but something took over my mouth when it came time to order. It was crazy. Instead of ordering the BBQ chicken sandwich with the BBQ sauce on the side... my mouth started asking for a fried cheese and bacon burger with sweet potato fries. Yes. You read that correctly. A fried cheese and bacon burger. I can't even lie about it - that was one of the best burgers I've ever eaten. 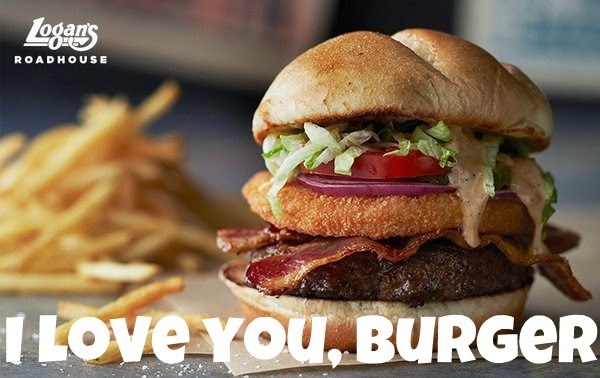 Whoever thought of putting fried cheese on a burger is my hero. The burger was amazing, the bacon was amazing, the cheese was amazing... my hands were shiny because of all the grease, but I don't even care. I can't begin to fathom how many Weight Watchers PointsPlus values I consumed in devouring that thing (yes, I absolutely ate the entire burger) so I think I'll just track it as 30 and move on. Haylee and I had lunch about 2:30 and when it came time to get ready for my run at about 7:30, I was still full. Really full. 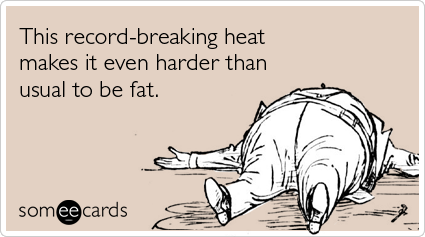 I have no idea how I got through my run, especially with the heat, but even after a three mile run, I am still full. Logan's Roadhouse, what kind of sorcery are you performing?! And more importantly... when can I see you again?! So maybe "Running with Pixie Dust" isn't the most accurate name that I could have given this blog. Is it too late to sell my domain and buy "Running with Fried Cheese" instead? I will admit something shameful to anyone who happens to still be reading this (which I have a feeling is no one). I have been looking at this blog for weeks. Just staring at it. Obviously not updating it, since my last post was in April. I've been running, so I could have written about that. I've started lifting weights again, so I could have written about that. I am back on Weight Watchers and have tracked successfully for a month now, so I could have written about that. Meaning I could have updated this blog with any of the things that I used to write about in it. No idea why I didn't. But here I am on my day off, after I've spent the entire day getting things done... and I thought it was about damn time I show up to my own blog. I would love to say I had some great things to say about my run this morning, but the truth is, there's not much to say about my running lately. Any of my runs in the past few weeks can be summed up in two facts: it is hot and I am slow. This morning did have a little bit of adventure though, when a bunch of guys from a lawn care company followed me in their truck and then one of them made kissy faces at me and pretended to lick me. Why, hello there, sexual harassment! 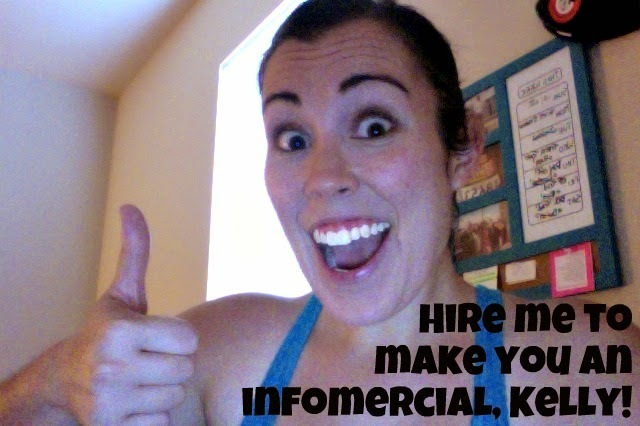 But in lieu of pitching a fit about HOW MUCH I HATE IT WHEN GUYS THINK THEY CAN OGLE ME WHILE I'M RUNNING... I thought it would be much better to bring back a tradition that I stole from the beautiful Janae. The Triple Tangent Tuesday! 1. 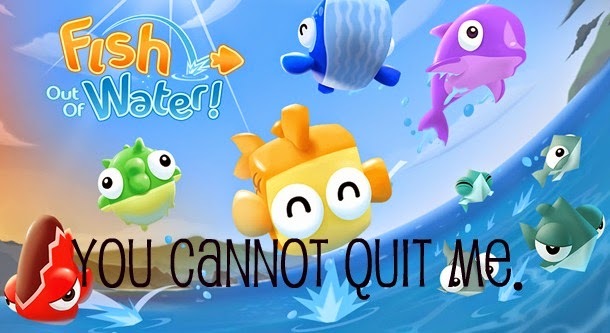 I am horribly addicted to a game called Fish out of Water. You throw fish across the water and see how far they will go and how many times you can make them skip on the surface. It is as dumb as it sounds, but I cannot stop playing it. I completely drained my iPad battery playing it. It's bad. 2. In trying to create that image (which took much longer than it should have because I have issues), I went to Picnik and had a near panic attack when I was reminded that there is no more Picnik. How could I add text to all of my pictures?! How could I make them more fun and entertaining for a blog that probably no one reads anymore?! Then I consulted Lord Google and found out about Ribbet. Crisis averted, everyone! 3. I have decided that I need to completely overhaul my wardrobe. I have also decided that I need to monogram everything in sight. 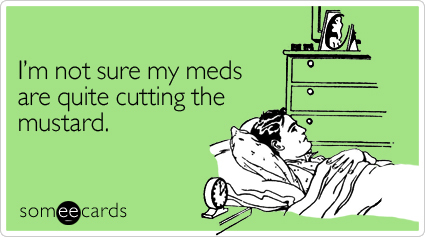 It is becoming a problem, especially because I really enjoy working 32 to 36 hours a week. I kid about marrying money, but seriously... it might be my best option. Sorry, Jamie. Regardless, the following are things that I have decided I absolutely must have. 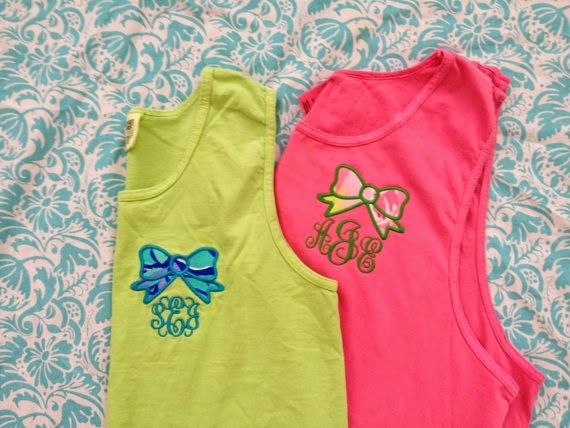 This monogrammed boyfriend tank in every color. I feel like the monogram makes it super classy and adorable, so it distracts from the fact that really, I just want to live in unisex tank tops all summer. 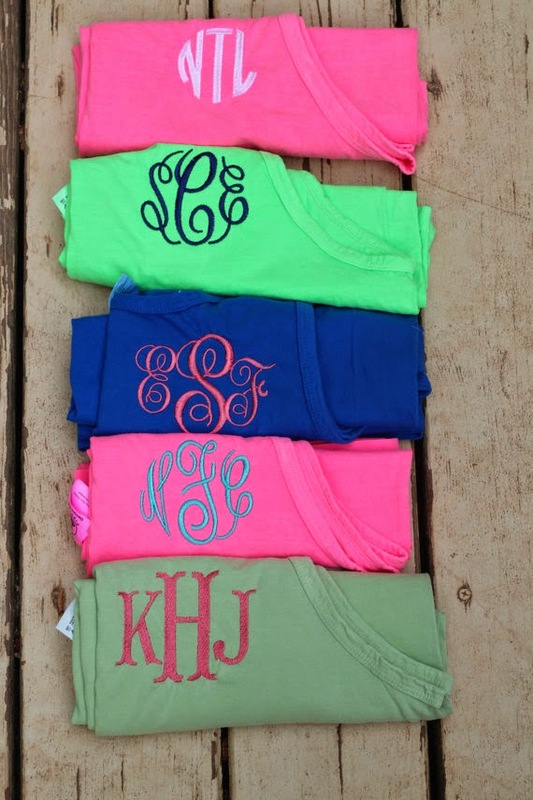 This monogrammed boyfriend tank in every color. You may be noticing a trend here. But look! This one is different! It has a bow and Lilly Pulitzer! So obviously I need to buy every color from both sellers. 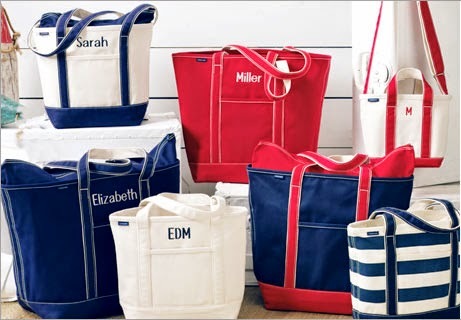 ALL of the Land's End totes. I have one and now I want 15 more. Why do I want more? One should be plenty. But it's not. And that's it. I got followed by some creepers, I am obsessed with a game of throwing fish, and I want monogrammed everything. Goodnight!